Highland Parks and Recreation offers several fitness programs as well as arts and lifestyle classes. From volleyball and table tennis to painting and dance, the Lincoln Community Center offers a wide range of classes and leagues for children and adults alike. The following programs are posted as a reference. 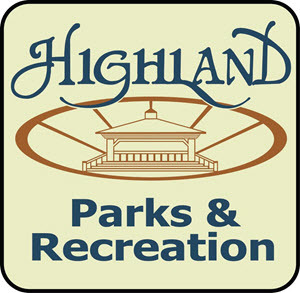 The Highland Parks and Recreation Department publishes a seasonal brochure which has information on all the programs, classes, events, and leagues offered to the community. The best way to keep up on current offerings is to view the seasonal brochure. Online Registration – Available for established customers (must be in our system with valid email address on file). In Person – Bring the forms to the Recreation Office. Mail-in Registration – Send the forms by mail to the Lincoln Community Center. Men’s and Co-Rec Leagues run April through August. Registration opens in February. Roster limited to 20 players & frozen once the limit is reached. Ages 18 and up. Men’s and Co-Rec Leagues run September through October. 14 game round robin season. Roster limited to 20 players & frozen once the limit is reached. Ages 18 and up. Cash awards given in each division. Court space reserved for unstructured open volleyball play. Ages: 15 and older. Note: Check weekly Fieldhouse Schedule before coming. Leagues run year-round. Teams play in a 10-week season with two matches (3 games each) per week. Rally scoring is used. This league is for recreational-level teams. Players must be age 18 or older and cannot also be participating in high school sports. Open year round. Participants are welcome to drop in and play other competitors. Open to all ages. Under 10 must be with an adult. Located in the banquet hall of the Lincoln Community Center. Open play and net rentals are available at the Lincoln Community Center Fieldhouse, pending the weekly fieldhouse schedule. Ages 15+ are welcome to drop in and play other competitors. Nets may be rented for private play. Move yourself with rhythm and grace to all kinds of music. Learn various dance steps and routines. Leather sole shoes recommended. If the instructor desires, you will switch partners throughout the session. Learn how to play an electric piano keyboard quickly and at a low cost. Read music, play songs, learn hand positioning and basic chording. Ages 16 & up. Colored Pencil: Designed to teach beginning and advanced colored pencil techniques, mixed medium will also be include. Acrylic Painting: Designed for the beginning as well as an advanced student. Learn not only the various techniques, but how to achieve the best results. Instructor will lead you through step-by-step painting your own 16×20 canvas. It’s a fun, no stress class and no experience is required. Ages 13 and older. Boys and girls grades K-5 compete in this league to learn the fundamentals of basketball while having FUN! Each team will be coached by a parent/volunteer and will play a 10-game season. Volunteer coaches are always needed. Teams will be determined by a player draft with the coaches. All players receive a T-shirt. Practices held on a weeknight determined by the coach and games are held on Saturdays. League typically held November through February. League format will be determined by registration numbers. Everyone receives a team t-shirt. The first place team will receive champion t-shirts. Teams will be chosen through a player draft with the coaches. Grades 6 through 8. Games typically held on Wednesdays in the spring. The league format will be determined by registration numbers. Teams will be chosen through a player draft with the coaches. Everyone receives a team t-shirt. The first place team will receive champion t-shirts. Games typically held on Wednesdays in the spring. Typically held at Highland High School on Wednesdays throughout the summer, this program is a great way for boys and girls ages 4-14 to burn energy, make friends, and learn the basics of running, jumping, and throwing. Plastic Frisbees and javelins are used as well as softballs in lieu of shot-puts. Classes typically include tumbling, balance beam, bars, vault, and air mat equipment. Ages walking to 3. Program allows child to interact with other children, become more coordinated, increase strength, self-esteem, and learn to follow directions in a fun class setting. Ages 3-5. Program is designed to help the student develop self-confidence and enhance physical capabilities in a safe and positive atmosphere. Ages 5-12. A confidence building sport that improves strength, flexibility, agility, and coordination. Specially designed for 1 ½ to 3-year-old children who have not met many other children. Class includes age appropriate activities, music, stories, and crafts, while meeting other parents and their children. Participants will also have unstructured playtime. Each parent assists with his/her child’s activities. Ages 7-12. Trained Instructor, Heather Leddy, will lead you through, step by step, painting your own 12×12 canvas. It’s a fun, no stress class and no experience is required! You will leave with your canvas creation at the end of class. Ages 10-16. Learn drawing, colored pencil, pen & ink. Perform cartooning, acrylic painting & more. Each session, students will build on what they have learned. New students will start from the beginning, returning students will continue from the previous session. A fun way to learn how to become an artist and appreciate art! Kindermusik is the world’s leading provider of music-based education for children from birth through age seven. We use the power and joy of music-making to help children learn and grow during the years most critical to brain development. Since 1978, Kindermusik has helped millions of children around the world build a strong foundation for a lifetime love of learning. Nancy Hehemann, owner/educator, has been teaching since 2000. Click on the file below for the upcoming class information. Classes for 3-5 year olds are structured to teach proper school behavior. Children are to bring a healthy snack & drink to each class, along with a backpack to carry home class projects. Children must be fully potty trained and able to leave mom for the full 2 hours each class. Throughout the school year they will work on sharing, learning ABCs, shapes, numbers & colors, and cutting with scissors, making crafts, working on listening skills & attention span while listening to stories. The country’s largest fitness program for new moms. Classes offer a stroller workout that combines power walking and intervals of body toning using the stroller, the environment, and exercise tubes. A great way to get in shape, meet other new moms and have fun with your child(ren). A classroom, video-based, instructor led course. Learn to promptly recognize several life threatening emergencies, give chest compressions, etc. Ages 18 and older that weigh a minimum of 110 lbs and are in good health may donate blood. Anyone 55 years or older are invited to attend these twice- per-month meetings (except for June, July, & August when there is only one meeting). The meetings are held the second and fourth Thursday of each month at 1 pm at the Lincoln Community Center. Meetings may consist of guest speakers, door prizes, & bingo. Throughout the year special holiday luncheons or picnics are held for members. Baked goods are provided by our members through the baking committee. Attendees will be asked to sign up to bake. Certain elderly and handicapped persons in the greater Hammond area may be eligible for limited basis transportation services. For more information call LCEOC at 219-882-6159 or Dial-A-Ride at 219-932-2530. The Town of Highland also sponsors a subsidized taxi program for seniors and handicapped. Eligible riders can get a half price discount (up to $5). Applications are available at Town Hall, 3333 Ridge Road or call 219-838-1080 for more info. Retail Merchant Certiﬁcate is required. Take-down: No later than two hours after show concludes. Tables, chairs, and cords are NOT provided. Vendors are responsible for taking unsold belongings when departing. Registration must be done no later than 1 week prior to selling goods, and as space permits. Recreational opportunities for individuals of all ages and who have special needs & abilities. By working together toward a common goal we are able to provide more events to a larger amount of people than any one agency alone. Do you like getting a bargain? Do you enjoy shopping for rare items such as comic books, sports cards, hot wheels, autographed memorabilia and many other collectibles? Roger Parker from P&P Collectibles will be promoting the card show in conjunction with the Highland Community Garage Sale. Register to sell your household items, toys, books and more! Concession will be available for purchase. Booth space selection is first come, first served. Tables, chairs, & extension cords not provided. You are responsible for taking your unsold belongings with you when you leave. Registration must be done 1 week prior to selling goods, as space permits. *Band lineup will be announced in summer brochure! Seeking vendors of ready-to-eat food, fresh fruits, vegetables, cheeses, breads, spices, coffees, soaps, etc.! Returning seasonal vendors may sign up beginning Feb. 1. Past weekly and new vendors may sign up beginning March 1. Tables, chairs & extension cords not provided. Summer camp is for ages 5-12 (must have completed Kindergarten) and takes place at Lincoln Community Center Monday through Friday from 8:30am-5:30pm with pre-care from 7-8:30am throughout summer, in accordance with the School Town of Highland calendar. See forms page for registration form and parent packet. Overnight trips depart from the Lincoln Community Center via spacious, video and restroom equipped motor coach. Trip details are available on ﬂyers and in the seasonal brochure. Overnight trips usually require an initial deposit and the ﬁnal payment is due usually six weeks before departure. Payment in full is required when registering for a trip. Refunds will not be granted for a trip, unless a wait list is available and your spot can be taken. You may also find a replacement for yourself and notify the Park Office of the person taking your place. All refunds are subject to a $3 processing fee. Individual medical insurance is not provided by the Highland Parks and Recreation Department. Individuals are responsible for their own insurance. Trip insurance is encouraged for anyone who registers for any overnight trip. Information for travel insurance is available when patrons register for trips and must be paid before final trip payment. Highland residents receive access to the following Munster amenities at the resident rate. For more information, call Munster Parks at 219-836-7275. Join other volunteers for our annual clean-up day! Everyone is welcome, especially community groups and families. Each volunteer that spends the day helping will receive a t-shirt and a free lunch at noon (must give shirt sizes so they can be pre-ordered). You will be assigned a park for clean-up. Bring gloves, rakes, and energy! Submit form at the Lincoln Community Center. See Forms page for registration form. This annual race is a kick off to Highland’s Twilight Independence Day Parade. All participants will receive a dry-fit t-shirt. Course is a certified 1-mile. USATF Certificate IN13013TDK. Note: Entry forms will be available at the Lincoln Community Center and on the Forms page beginning in May. On race day, registration will only be held in front of the School Administration Building from 5-6:15pm. See summer brochure for more information. See Forms page for registration forms and course maps. For race results, please visit www.thtiming.com. Santa’s March and Tree Lighting Ceremony – the Saturday after Thanksgiving. 4:30pm parade starts down Highway Ave. and 5pm tree lighting / visits with Santa at Main Square. New Year’s Eve Fireworks – midnight at Main Square. Hot Chocolate will be served.